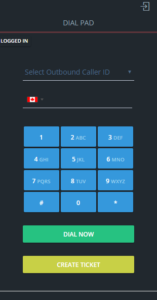 Integration with Zendesk allows you to create automated tickets based on certain events that occur in Nectar Desk like missed calls, voicemails, completed inbound and outbound phone calls. You have the ability to create a ticket from the dial pad function. The ticket is only stored in n your Zendesk account. You will only see this activity through Zendesk, our system will not track this ticket.